*Currently there are no regular classes scheduled. To schedule a private class with up to four students, or to schedule a class at your location, please email Jen. Classes are great for birthdays and other events - we love themes and special requests, too! This 90-minute class covers everything you need to know about making fancy cupcake designs in buttercream! 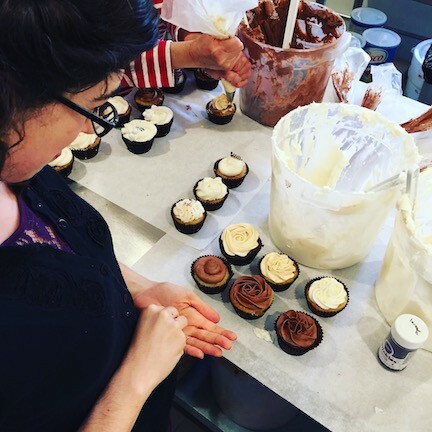 This will include instruction on a variety of techniques and hands on practice, and you will leave with a decorating kit and basic recipes so you can make the designs at home, plus 6 cupcakes that you have decorated. No previous baking or decorating experience is necessary. Appropriate for age 10 and above. We are happy to accomodate any dietary needs/requests. Each class has a maximum of 4 students, and the cost is $60 per person. Please be prepared to stand for the length of class. View our class availability and register here. Once you register, you will receive an email confirmation and further instructions, and you will have an opportunity to make any special dietary requests at that time.